Turbine available NPSH calculator - formula & step by step calculation to measure how close the fluid at a given point is to flashing creates the cavitation. NPSHA = (p0/ρg) - (pv/ρg) - (ze - z0) + hf. Total pressure at lower free space p0 in kPa, vapor pressure pv in kPa, fluid density ρ in kg/m3, standard gravity g = 9.80 m/s2, tube entrance elevation ze in m, lower free space elevation z0 in m & turbine minor losses hf in m are the key elements of this calculation. 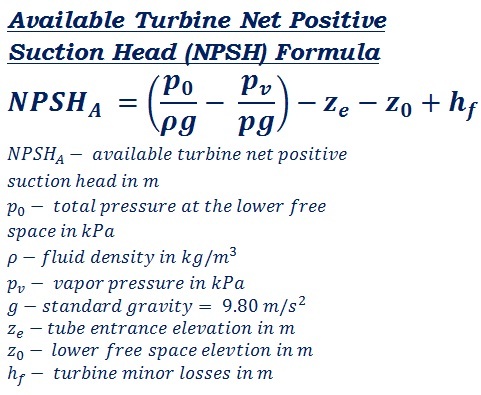 In mechanical engineering, the below mathematical formula is used to calculate turbine available NPSHA (Net Positive Suction Head). The step by step calculation for each set of inputs let users to undersyand how to perform such available NPSHA calculations manually. In the field of mechanical engineering, while working with hydro-power plant erection, sometimes it's important to analyse the turbine available NPSH. The above formula & step by step calculation may useful for users to understand how the values are being used in the formula, however, when it comes to online for quick calculations, this turbine available NPSHA calculator helps the user to perform & verify such calculations as quick as possible.